Like the Texas Tower killer, the “Dark Knight Rising Killer” was, reportedly, being treated by a university shrink. If I tell my shrink, “excuse me while I grab my Uzzi,” should he report it? There have been so many panic-inducing killings since the 1965 Texas Tower Massacre, Americans are inured to the shock, and some of those Americans are shrinks. 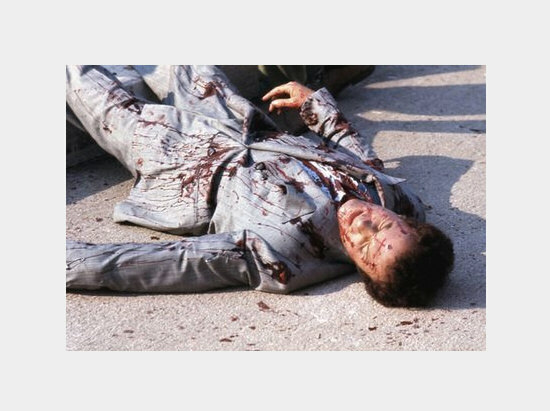 The likelihood that you will be gunned down in your movie-house while watching a re-run of Scarface is slim to none, but Americans winced at the image of 70 gunned down in Aurora, Colorado. Open on overview of Berkeley’s People’s Park. Over the scene we now hear sirens. Now camera moves to street sign: TELEGRAPH AVE. Dark, and more dark, but we can see through. Reporter’s voice: Yes, this is famous Telegraph Avenue scene of bloody riots in the sixties…near the grizzly murder last week of a beloved People’s Park dog — Dude. Park regulars with nowhere else to go because they’re homeless are calling “their” dog’s death — Murder. Voice Over: This is People’s Park. It’s 1 a.m. That’s me down there, the good-looking but so dead dog with all the screaming people going nuts over me. People’s Park was to have been my dream — like your swimming pools and backyard barbecues. 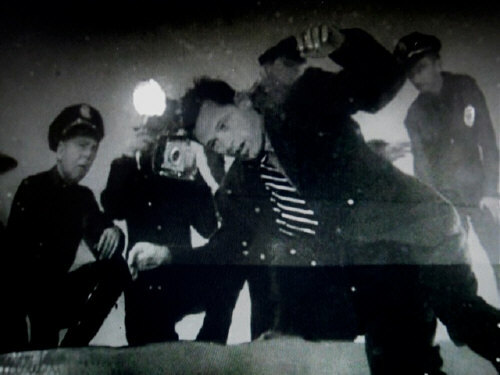 Joe Gillis, pictured here in Norma Desmond's pool, 1952, near Sunset Boulevard. Dude had been shot in the shoulder and back; according to nearby witnesses who rushed to the scene after hearing the shots. His dead carcass was removed by a university refuge-removal truck. 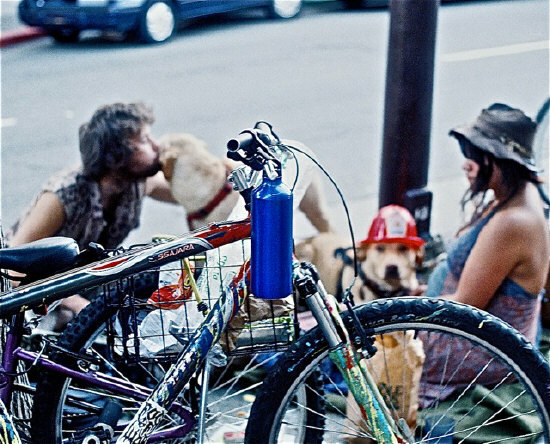 The story began in San Francisco’s Golden Gate park where Dude and his new owner met and hit it off. Gus decided then and there to “adopt” the dog from a litter, for his side kick. Just a boy and a girl and their dogs on Berkeley's Telegraph Ave, People's Park's living room. Photo by Ted Friedman. After a rousing disruptive protest at city council a month ago, it seemed protesters had nothing else to accomplish. And it was clear a despised no-sit measure was assured to go to the ballot. The last hurdle was pro forma. But don’t tell major media. The Berkeley city council (AKA “People’s Republic of Berkeley) would surely attract major media from across the bay, and Oakland-San Jose, as the no-sit measure cleared its final hurdles, last week, before going to voters in November. And sure enough, the media vans were parked in their usual places on Martin Luther King Jr. Way, across the street from Old City Hall. Tale of two crowds. 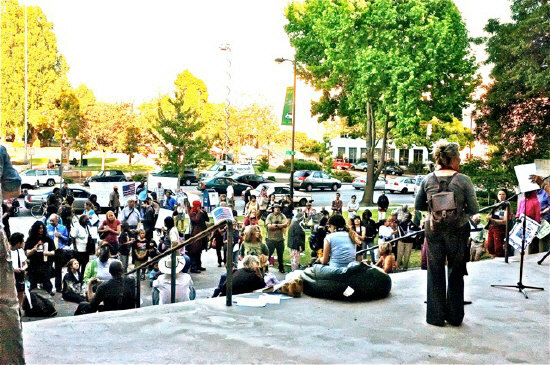 June 12, before first no-sit Berkeley City Council protest. Crowd #1. Photo by Ted Friedman. Godfather quietly turned forty a few months ago, but except for a joint re-release by Paramount at fifty-five nation-wide Cinemark theaters, the birthday lacked hype. Godfather at forty was as big-screen near Berkeley as Walnut Creek, or San Jose. “The year it was released The Godfather won three Academy Awards, including Best Picture, Best Actor (Marlon Brando) and Best Adapted Screenplay. Since its release the film has made nearly $250 million at the global box office and is considered by most to be one of the greatest films of all time,” according to Cinemark flack. Saddest scene since death of Bambi, Disney, '42. Sonny buys the farm, leaving behind a four picture deal. Big Brother’s 4th of July patriotism flaunted itself this year. I was there covering the festivities for the Berkeley Daily Planet. Ted Friedman. 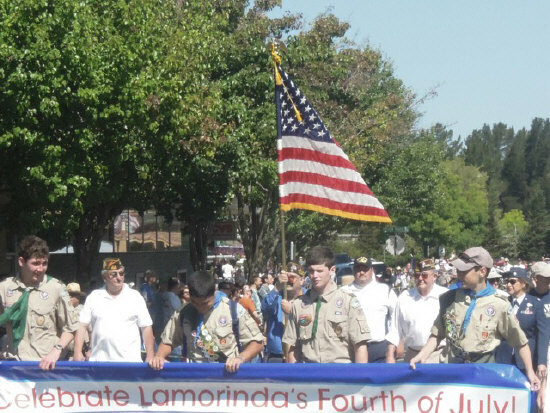 Orinda, Ca., July 4th, calling itself Lamorinda, three nearby towns. Remember those sing-alongs, or those follow the bouncing ball cartoons of the ’50’s, which were low-tech karaoke? You had to participate to entertain yourself. Now imagine that we are asking you to write our story for us — a sort of write-along. We’ll provide some loose “facts” or details, and all you have to do is put it all together. We’ll make a recommendation. Maybe you’ll want to submit your piece to berkeleyreporter.com, where we will publish the best story we get, based on our write-along piece. Publishing in Berkeley Reporter — BFD? We can appreciate that response. 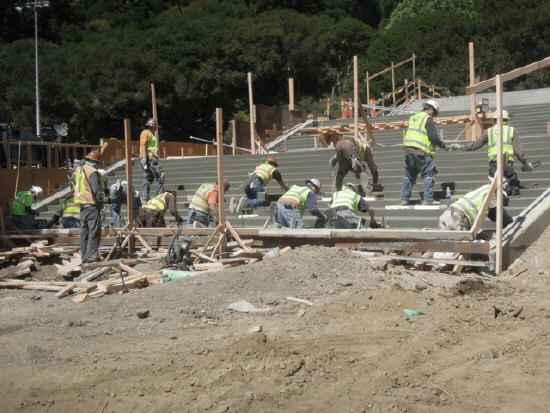 Cal stadium workers building stairs to the football new stadium.